The public must come to see that chess is a violent sport. After a string of uninterrupted study days*. I find myself, a little run-down and less engaged this week. Sometimes I wonder about What it is with chess- what about the game leads to such fatigue and exhaustion?. Is that I face the board all full of emotions and wishes and concerns?? 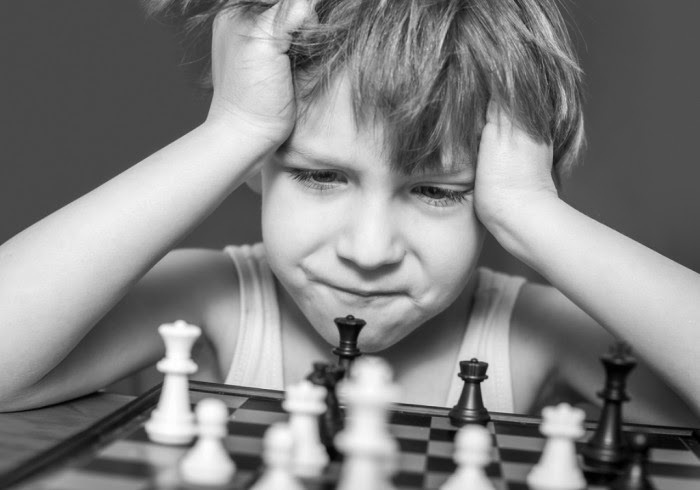 BlunderProne has penned the very excellent Blog Entitled “The Psychological Game; Confidence Index”… and focused on some of the factors that affected the way he played tournament chess. But I think this excellent subject is broader than that! And I would go so far as to say as the psychological game just might be the definitive factor in your performance and the fact that your game can implode into a tsunami of feeling; is part of the “mental torture” Garry is talking about. The best players, though, dedicate themselves to being Resilient. Resilence comes from being prepared. And while experience is perhaps the best teacher, it doesn’t hurt to examine your inclinations and failings some. (to this end, is my blog dedicated). So what Are some of the major reasons that performance can decreased so drastically, or to put it in George’s lingo- what kinds of factors can affect performance factor?? I want both examine the feelings, the causes and how to improve in this matter. You get into your game and carefully strain and look for a break. Something little happens and you find yourself with initiative; in charge of your destiny- and looking for a weakness on the board. Your spirits soar and you optimistically charge into his position; then all the sudden the unexpected occurs! You thought you had a road to checkmate and suddenly the pizzazz in you game in gone. It is YOU that is defending. There’s nothing worse than a sudden change of fate- and if it has come about from some kind of miscalculation in your tactics, the effect is even worse! The fact is that they kinds of events always create layers of strong emotion; anger (at myself), frustration (am I just Not seeing), disbelief (always once when it leads you to deepen your weaknesses), and fear (perhaps I’m not improving). Moreover my limited experience at tournaments suggest that this only intensifies in a tournament; its easier to shake off a miscalculation among friends than a important, serious tournament round. I might go so far as to say, that for me, this is the biggest and most common psychological issue in the whole game! It is also somewhat hard to address; with constant practice of carefully chosen (if not composed) problems, only deepening the issue. But there is yet, ways to combat it and I really think this is the very point of increasing your opposition. Someone harder (but not utterly beyond you), isn’t going to go down without a fight. Also good is the PC; One thought I liked and have dabbled with is to set it up in a definitive Piece-winning tactic. In many positions the PC will scramble to save itself from a deepening disadvantage; and in a complex situation you might have to be pretty careful not to start losing just as you grab your piece. this is another big one for me! Sometimes in chess the position becomes quite balanced; and as the tension mounts everything starts feeling like their stuck to the assigned tasks and roles. Sometimes the position can be quite simple or it can be mind numbingly complex. Sometimes it more of a fear and other times it just becomes too complex, and all seems to calculate back into a big fat standstill. Uncertainty! It can sap the will the win, and it can make it very hard to go forward. The old standbye was to attack a piece, and I see that old habit in my play all the time… but unfortunately, “attack a piece” is pretty poor strategic play; and if it works on the weak- the strong will merely remanuever the piece to a better place. I’m very convinced this Specific issue is at the core of why we need coaches and/or good annotations. Having a plan is a foundation to positional chess and is worth a GREAT deal of strength. That is its not the only factor in your chess strength, but a wise and careful plan that utilizes your opponents weaknesses almost always give you the advantage if you have the tactical wit to see it. In other games; you might just grind your opponent down to a win. I think its interesting, that recently between my friendly OTB chess games and with my now constant routine of turn-based chess that ‘time control’ doesn’t have much influence in my game right now. And yet, even without a clock ticking down to defeat, still time is STILL a heavy responsibility. That is, one can Always keep on spinning the variations in ones head; and/or scrutinize over the opponent or ones own pieces. But when Have I arrived at a good conclusion, when has my analysis become redundant; (even worse when Have I done , so MUCH analysis that I’m losing the whole thread of the game! and might forget important stuff). Even in a game with an indefinite time control still there is the prudence of playing a careful opening fast, and the importance of being methodical in a real tense battle. And here the emotional element becomes quite relevant here as well! I still tend to play out big moves fast, as if the suddenness of it makes it better! And I tend to play far too slow when uncertain. The reaction aside, the emotion, impatience is an awful one for chess. And indecisiveness, can easily lead back into the stupor. In fact, I would submit, that Time and mastering it better is important in All forms of chess- and I find myself keeping better and better notes about how much time I’m taking. I’ve talked to the most regular opponent in my chess club; I intend to follow up; by bringing a clock and using it! In conclusion; the mental game is HUGE in chess! To be as good of a chess player as we can one must MASTER ones emotion, not letting them derail a careful, objective and forceful plan to win the game. To do so will really demand a lot of attention, patience and determination - But the rewards of becoming more serious, determined and careful is to increase in chess strength and gain joy knowing I have really struggled to master a truly ardous game! I hope you like it as I had the same idea what you have presented here at this post. However there is one important difference: I did not write as deep and specific elements as you did. 1. THE REFUTED ATTACK: it depends what position I get after my attack is being refuted. Am I material down? If yes - how much? How much time do I have on my clock? What about my opponent? I see no problem with defending even if it is quite hard and most players rather want to attack than defend. However the worst defence is when you cannot improve your position and find a plan to do it. For me it is equal to resign the game (especially against solid player). 2. I DON’T KNOW WHAT TO DO? That's right. If you can comprehend most positions you reach and you know what to do - you are probably quite solid player. The most difficult is not to find the specific plan, but the moves in a proper (correct) order. Otherwise if you plan the wrong moves first - you are doomed to defeat. 3. MISMANAGING TIME: the more difficult position, the harder to find a correct move. And this process takes time - sometimes a LOT of it. The ideal solution is to steer the game to the positions we reall knows very well. This way we would not need more than a few minutes at the key moments. And it may guarantee that you will not get into time-trouble. Strong players are most often stronger than us mere mortals (amateurs) at most or all the levels. It does not matter if we take into account: emotions, strategy, calculations, managing (and coping with) stress and time and so on. And to sum up - there is a lot of truth at saying: "Chess is mental torture". It is especially visible when you are playing (competing) at chess tournament against strong players. And if you feel the enormous pressure that you HAVE TO win all the games (instead of "playing the games as best as I can") you may burn out your psyche, emotions, nerves and spirit. Chess at sporting perespective is a VERY demanding discipline - it is the same like boxing (but at mental area). I think there are differences between chess players that create our own significant strengths and weaknesses in the game. I think it is interesting on how your approach to refuted attacks and unclear positions differ from my own. I think I have a harder time with refuted attacks and not quite as much with a lack of a plan. in my way of thinking, there is always a general guideline... and it is only when I struggle to find a good guideline, that I stumble. on the other hand, a refuted attack generally messes with me pretty good, because normally I have made at least a positional concession to get my peices where I think they have a strong attack. You might call this, the MAIN path for me to lose a game. I see some big opportunity, send peices to attack- it is deftly defended, and even without sacrifices the oponent will have several ply to concentrate on all the weaknesses I created! ... in this regard, I am Totally worse than any opponent. After all, an opponent has to come up with a clever moves that don't arouse my suspicion. as you said, strong players play a different kind of game altogether; my understanding is that they are constantly Looking at ways there play might fail, and they carefully build on their advantages until their attack cannot be overcome. I think the whole seperate issue of how deeply you can formulate and adapt a plan to the position is more in the realm of positional chess; and I frankly struggle with (positional chess) . I understand a fork when I see it, so seeing it fall through is very disssapointing. but the positional game is more of one imbalance over another; its harder to understand- its less clear when things go badly. maybe my game is very limited by my positional shortcomings; but It doesn't have quite the same pychological impact either. You have touched a few interesting points! I will try to comments some (most?!) of them. 1) We are probably different (level) players as I try to assess (evaluate) the position BEFORE I start attacking my opponent. I DO NOT attack unless I am sure it is the right way (and moment) to do so. Actually I have problems with attacking play and that's why I prefer playing solid chess than "bombs away at each square". 2) When I am defending I ALWAYS try to look for the ways I defend my weaknesses and IMPROVE the pieces, coordination and sometimes even try to intercept (regain) the initiative. If I see the attack that is extremally hard to stop - I consider giving back some material - to finish my goals (most often development and coordination). I have learnt this "trick" as I was mated or crushed too often ;) :). Of course it requires to know (to practice) when material should be given back (lost with the cost of initiative) and what way is the best one to do so (the less material to lose and the best development and coordination to achieve SIMULTANEOUSLY). 3) It is hard to understand to me - what you meant saying "After all, an opponent has to come up with a clever moves that don't arouse my suspicion". Anyway - I try to build up the game SLOWLY - I only make an exception if "quiet game" is not going to work. Then I start playing sharp, attacking and dynamic chess - and search for the chance to get into drawing zone (most often I have material deficit). a) constantly looking at ways their play might fail - it is called "looking for REFUTATIONS". It they see that their move may be refuted (easily) they slow down and "dig up" the board quite deep. That's why it is SO HARD to beat them even if they obtained a worse position. b) "they carefully build on their advantages until their attack cannot be overcome" - that's the most powerful weapon EVER invented (discovered). I would change the second part of the quote to "...until their position is so strong that you cannot STOP the enemey forces" (to make your position like a swiss chess - full of holes that are exploited by your opponent). 5) Positional chess is really hard to master. It is NOT because it is the difficult topic itself. It is because it consists of MANY additional ones! If you are a good positional player - you have to understand and evaluate if your opponent's attack is a correct one or may be refuted. And you have to feel the balanced elements and the factor of TIME. Sometimes the position looks VERY promising, but deeper look "below the surface" may show that in fact... it is barely equal! (or in extreme case - simply lost!). And you are right - it is "much harder to understand and less clear when things go badly". And to sum up - the good (or bad?!) news: if you are NOT able to understand positional play (and use this skill) - you CANNOT call yourself a good player. 95% f players rated 2000 or more... is going to crush you no matter what opening you will choose. And what's the most depressing - if there are NO tactics - just an equal position - most amateurs simply collapse... as 'there are NO objects to attack' - at their perspective. If chess would have been tactics ONLY - it would not survive such a long period of time. You have to be "2600 rated tactician" to reach 2000 level - as without positional play (and strategy - in general) - it is close to IMPOSSIBLE to work out the moves that do not lead to worse (or simply lost) position when there is no tactics in the air. I hope now most elements may be seen in another perspective (it was my intention).